When I heard that Moose Maple Butter existed, I was pretty excited about giving it a try! I was also pretty mad at myself for not coming up with this winning combination. Purely and simply it is a delicious mix of Pure Canada No 1 Maple Syrup, fresh British butter and a dash of sea salt - it comes in a big tub ready to spread on your hot crumpets, waffles, toast, croissants, pancakes...the possibilities are endless! As a huge fan of sweet treat foods such as waffles and pancakes, the prospect of adding something naturally sweet to them instead of lashings of sugary, high fat, processed spreads, was a great one - I'm all for finding natural alternatives when it comes to my food, and am trying to be as health conscious as possible without ruining the enjoyment I get from the food I eat. I've recently made my own natural chocolate & hazelnut spread using raw cacao powder, hazelnuts and maple syrup, and it is utterly delicious, and feels like a really naughty, decadent eat, when it is actually really good for you. The same can be said for Moose Maple Butter - all natural, all delicious. 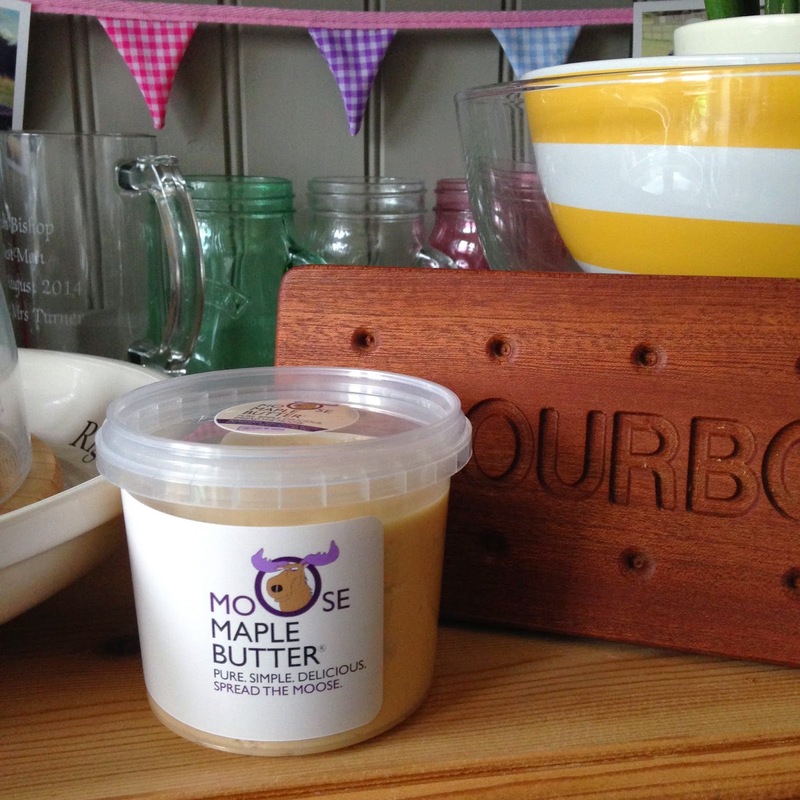 Moose Maple Butter originates from the USA and is only available in a few select locations in the UK at the moment...but watch this space, it is being launched nationwide this year! I'll update you when it is more readily available - but also check out their website and social media pages (links at bottom) for regular news and information regarding the UK launch. 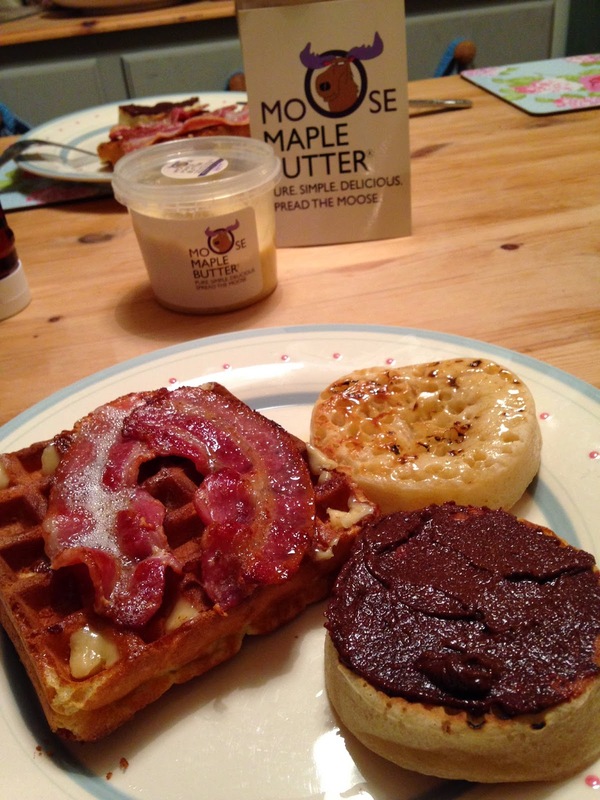 We have enjoyed our Moose Maple Butter spread over hot spongy crumpets, on homemade waffles with streaky bacon, and I've been having it for breakfast on toast. The balance between sweet and salty is perfect for me: being neither overly sweet or overly salty. The maple after taste is rich and warming, and the butter is unctuous and creamy. It really is a heavenly combination. What an enticing plate of deliciousness: Waffle with Moose Maple Butter & streaky bacon, crumpet with Moose Maple Butter, and another crumpet with my homemade, all natural cacao & hazelnut spread! For a 10g serving of Moose Maple Butter it is 72 calories, which is on par with most salted butters on the market - this is brilliant for a calorie counter like me! 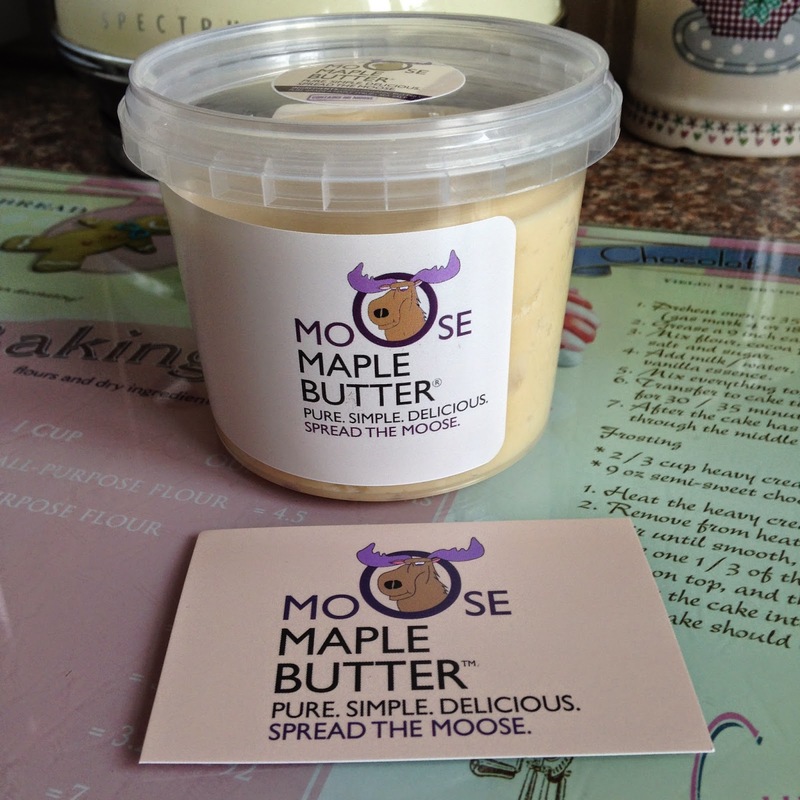 Disclaimer: I was sent a preview tub of Moose Maple Butter for the purpose of this review - all opinions, words and images are my own, excluding the Moose Maple Butter logo.